Clairol is once again establishing itself as the category leader in innovation by introducing a solution that keeps roots looking fresh at every stage of the coloring cycle. Our new Root Touch-Up Color Blending Gel is a semi-permanent formula that is the perfect quick-fix solution for first grays and last-minute roots emergencies that doesn’t need to be reapplied after every wash. Great for salon goers or dedicated DIYers, the semi-permanent formula blends seamlessly into your existing color and doesn’t need to be reapplied after every wash. It gradually fades after 10 washes, allowing consumers to prolong the time between their coloring sessions. Studies show that 32% of women will get gray hair before 30, yet 59% of salon colorers do nothing to touch up their color between salon visits. As the everyday consumer’s lifestyle becomes more demanding and fast-paced, there is a greater need for a high caliber, high convenience color option. The addition of Clairol’s Root Touch-Up Color Blending Gel fulfills a previously unmet consumer need – a solution between one-wash temporary solutions and permanent root touch-ups. No matter the consumer’s preference, we’ve got her covered. Our first ever semi-permanent, reusable color blending gel features a simple brush-on formula, allowing consumers to quickly spot-treat first grays and color regrowth in 10 minutes. The formula requires no mixing and leaves hair soft, shiny and free of damage. Even better, the reusable formula and twist and lock cap can be kept in your vanity for whenever your roots need a quick refresh. The launch of the new Root Touch-Up Color Blending Gel positions Clairol as the go-to color brand for a complete portfolio of root products to cover every stage of the color cycle. The most extensive shade ranges, permanent, semi-permanent and temporary offerings, and solutions for last minute touch ups, on-the-go, salon holdovers and permanent fixes. Clairol Root Touch-Up Color Refreshing Spray is a fast way to cover up your grays while providing natural-looking, water-resistant coverage that lasts until your next shampoo. With an application time of just 3 seconds, it is perfect for a quick touch-up before leaving the house when you need a last-minute solution. Clairol Root-Touch Up Concealing Powder provides on-the-go precision powder coverage in just 10 seconds. The multi-use solution, which can also be used on your brows; covers single strands, refreshes roots and touches up temples — lasting until your next shampoo. This is your beauty must-have to keep in your purse at all times. Clairol Root Touch-Up Color Blending Gel refreshes roots in just 10 minutes without damaging your hair or salon color. The reusable, damage-free formula lasts 10+ washes, does not contain ammonia or peroxide and will extend the life of your hair color until the next salon visit. Available in 6 shades that will blend seamlessly into all hair colors. Clairol Root-Touch Up Permanent Crème Hair Color is the #1 root touch-up solution for long lasting color. With the largest root shade palette available, it provides 100% percent gray coverage in under 10 minutes that will last up to 3 weeks. Clairol’s full roots portfolio can provide a solution for needs at any stage of the color cycle. 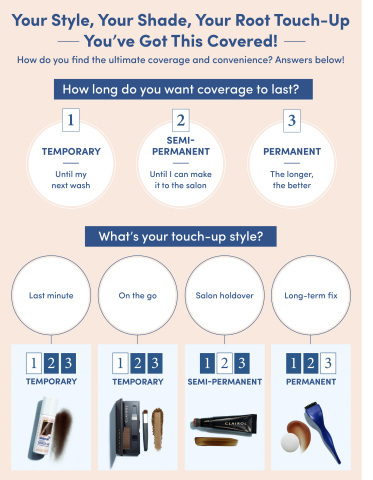 From quick fixes to longer-term solutions, Clairol has you covered! Visit Clairol.com to see more information on the full roots portfolio. Clairol Root Touch-Up Color Blending Gel is available for $9.99 at major retailers: Walmart, Target, CVS, Rite Aid For more information, consumers can visit www.Clairol.com or call 1-800-CLAIROL.